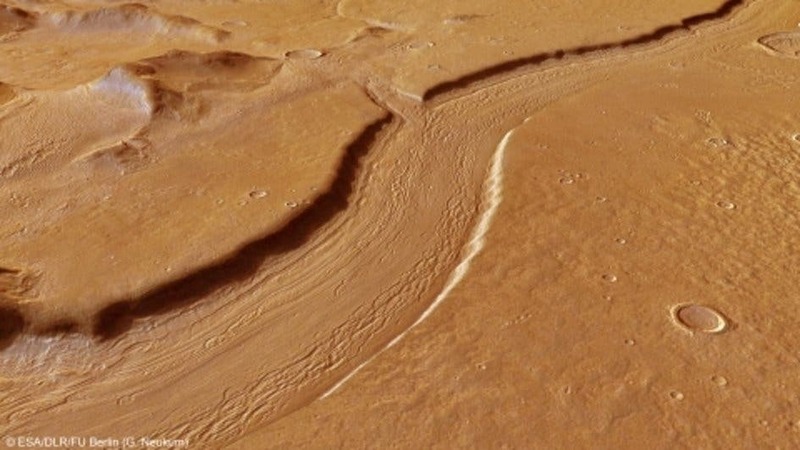 Using combined imagery delivered by the High-Resolution Stereo Camera (HRSC) and recent color channel data, the European Space Agency has recently discovered the vestiges of an ancient river that used to flow through Mars’ highlands. The river is 1,000 miles long and at some points 4 miles wide and 1,000 feet deep. The images are simply stunning and it’s enough to catch a glimpse for imagination to take care of the rest. A stunning world riddled with rivers and oceans tells of a watery past, not too dissimilar from modern day Earth, possibly blossoming with life. With this in mind, I highly recommend you check these fantastic and realistic-looking renditions of how Mars might have looked like a few billion years ago. In these views, ESA imaged the ancient river that used to flow with water between 1.8 and 3.5 billion years ago, before running dry due to evaporation. The river, which the agency named Reull Vallis, even has tributaries and quite a few actually. In the color-coded version from below, one can see how the topography of the Reull Vallis looks like – the main channel is coded in blue, while neighboring Promethei Terra Highlands are coded in red. Equipped with a regular and a topographic view, ESA scientists built a computer generated image of the region that offers a much cleaner view with perspective. If you look closely right in the upper part of this “S” shaped portion of the Reull Vallis you’ll see evidence of what was once a tributary river. Amazing!